What did I expect? Travelling to Texas as often as I do I’ve had plenty of opportunities to toss back the local Shiner Bock. Not a bad beer at all, but not something I’d generally review on this site. Just not an Alehead beer. Most of the ratings on this site are high because we all drink good beer and seek out new and exciting brews when we have a chance. We’re not really a rating site per se so most of our tasting notes are done as a way to bring attention to a cool beer or something we’ve all been talking about. Why bother bashing a beer or brewery when we already know that it’s not supposed to be good? 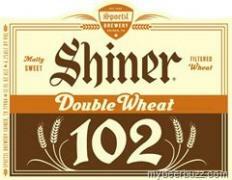 When I saw the Shiner 102 Double Wheat though, I figured it would be worthy of a taste and even if it didn’t blow me away I thought it might provide an opportunity to post something on a non-craft brewery. I should have known better. TASTE: Not as sweet as the nose would suggest, although certainly sweeter than I’d like in a Pale Wheat. Definite cereal taste going on. Not cereal grain mind you, more like Corn Pops. A slight bitter, grassy finish is the only thing that saves this from being an utter disaster. Where’s the booze though? We’re not talking about a huge beer here but being that there’s not much going on in the taste department you’d think it would have some bite. Guess not. DRINKABILITY: Don’t bother, there’s just too many better beers out there. It’s not necessarily what I’d consider a “Bad Beer”, but it’s not great either. I’d drink it over a Bud but I’d be desperate to find something else as soon as the next round hit. Posted in Tasting Notes.Tagged 1 Hop, 102 Double Wheat, Shiner, Spoetzl Brewery, Texas, Wheat Ale. The advertised taste profile on the label might be the most lackluster I’ve ever seen: “Malty Sweet; Intense Wheat”. Thanks! You just described exactly the kind of beer I never get the urge to drink. Ever. I didn’t even read the label until I got home – Stupid, stupid Doc. When a beer shares the same description as your breakfast cereal, it’s best to avoid (Unless there’s a prize like some sort of decoder ring). it’s the creamy hot cereal with the coco treat!